Hilltop Tots Day Nursery in Talke is a small group preschool setting with places for only 6 under 2's and 8 over 2's. This enables us to provide a more personal and nurturing approach in a relaxed and homely environment. We really get to know you and your child, tailoring our care to be individual to your needs, wishes and feelings. We also find that being a smaller setting encourages children to settle in easier and quicker, and to form positive relationships with children and practitioners. We have designed our facilities to inspire children to have fun and enjoy learning. We have lots of unique facilities including our sensory room, which is one of the only sensory rooms in the area, indoor secret reading garden, Sensory Garden role play village and much more to explore. 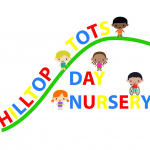 Hilltop Tots Day Nursery in Talke, Stoke-on-Trent is easily accessed via Newcastle-under-Lyme, Kidsgrove, Alsager, Chesterton, and surrounding areas due to our location next to the A500 by Freeport Talke. We accept 2, 3 and 4 year funding and tax free child care and if you are not sure how to apply for this or if you are eligible we would be happy to help you with this. Come to see for yourselves what Hilltop Tots has to offer for you and your family!